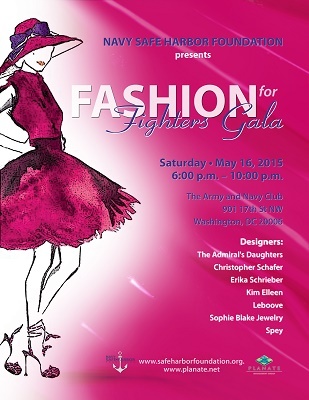 Join us for the first annual Fashion for Fighters Gala – an evening to raise funds for wounded, ill and injured U.S. Navy, Coast Guardsmen and their families, hosted by the Navy Safe Harbor Foundation (NSHF). NSHF is dedicated to supporting the recovery of Sailors, Coast Guardsmen, and their families by assisting them with resources not currently provided by government or community resources. We then invite you to get up on the dance floor while our DJ plays your favorite songs as we conclude the night’s festivities. VIP tickets holders will be treated to an exclusive fashion presentation starting at 6:00 pm, open bar and passed hors d’oeuvres. We won’t have you walking away empty handed either as the first 20 VIP guest will receive a swag bag full of products from our gala sponsors. General admission ticket holders will enjoy a cash bar and passed hors d’oeuvres starting at 7:00 pm. Inspired by the growing needs of the military community, Navy Safe Harbor Foundation was created to efficiently identify and meet the needs of wounded, ill and injured Sailors, Coast Guardsmen, Merchant Marines and their families. The Navy Safe Harbor Foundation will fill the gaps of current nonmedical provisions through collaboration with federal and community resources. NSHF wants to ensure that every service member is given an opportunity for full recovery by providing financial assistance, respite care, special equipment, transportation, recreational opportunities, and other services. The Navy Safe Harbor Foundation (NSHF) is an IRS recognized 501(c)3 tax-exempt non-profit organization. The NSHF is not affiliated with the United States Navy, Coast Guard or Department of Defense.